North by Northwest can be more than the position on a campus if you found yourself at a wine tasting in Sandwich in the summer time. At a recent tasting at the Belfry, I was looking for wines to serve our guest at our bed and breakfast and was taken in a whole new direction as we tasted NxNW wines from King Estates. 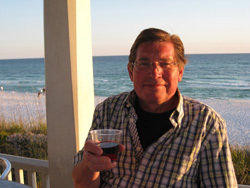 The King Estate wines from Eugene, Oregon was one of my early introductions to great wines from Oregon. Tasting their Pinot Noir in the late 1990s made me see that I was limiting my potential wine enjoyment when I only focused on California wines. The highly successful King Estate has moved into new geographical areas as they expanded from their traditional strength in Pinot Noir and Pinot Gris to other varietals. The King family NxNW project is focused on grapes from vineyards in the Columbia River Basin that spans Oregon and Washington. Many consider this Columbia River Appellation an emerging wine growing region with unique ‘terroir’ that holds promise for great wines. Spencer Knowles, Wine Manager at the Horizon Beverage Company, guided our tour of this new frontier, as we tasted four wines from NxNW. With over 80 attendees at the tasting, I helped my friends from Cellar 55 Wine Merchants pour. I previewed all the wines, but was too busy during the tasting to experience the food parings, which everyone raved about, so I’ll only talk about the wines and not the food parings. We started with the NxNW 2010 Riesling Horse Heaven Hills. As the NxNW project stresses the ‘terroir’ and different varietals, this Riesling exemplifies both. It is a dry and crisp wine from contracted grapes grown in Washington State’s renowned Horse Heaven Hills AVA. Like all NxNW wines, there is limited production --for the Riesling only 5,000 cases were bottled--which may sound like a lot, but isn’t when you consider that King Estates’ Acrobat label produces 42,000 cases of its Pinot Gris. I am not a big white wine person, but have been serving the Acrobat at the Inn since a tasting last year and may try the Riesling this fall. 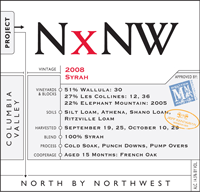 Next, we went to the NxNW 2008 Columbia Valley Syrah, my favorite of the night. Although I missed the paring, I am sure this big wine went great with its steak paring. This is a very limited production wine with only 333 cases produced and we were very lucky to taste it and have the opportunity to purchase it. NxNW labels are visually interesting and very informative. They include all the ‘technical’ information about each wine including the Vineyards, Soil type, Harvest date, etc. Although maybe more info than anyone needs, I find it fascinating. But then I like the details. The case production is the only other item I would like to see on it. Then you would know just how rare and special a wine is. 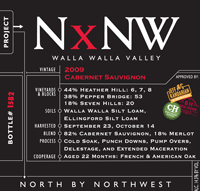 We finished we two Cabs, the NxNW 2009 Columbia Valley and the 2009 Walla Walla. Both were big, heavily tannined wines that will age well. Although they are both distributed nationally, at 5,000 cases the Columbia Valley is more readily available than the Walla Walla at only 675-6 packs. The more exclusive Walla Walla is also sequentially numbered, another fact that is on its label. The Walla Walla Cab, like the limited production Syrah, was a real treat to taste and have the opportunity to buy. Come stay with us at our bed and breakfast and I may be serving some of this great, rare wine from the Northwest.